Ace skateboard trucks are made for skateboarding. The Ace 44's are made specifically for boards between 8.25" and 8.75" wide. The 44's are a high truck and come with a low set kingpin, responsive bushings and a non slip axle. 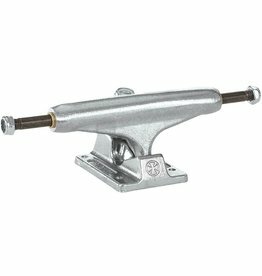 The Polished Hi 5.25 skateboard truck from Venture offers the quality and durability that you expect when skateboarding. This truck measures 5.25" wide and 2.1" in height, and works best with decks that are 7.75" to 8.25" wide.